To Jupiter — and beyond! Forty years ago today NASA launched the Voyager 2 space probe from Cape Canaveral on a mission to the outer planets. Its twin, Voyager 1, blasted off two weeks later. Voyager 1 reached Jupiter on March 5, 1979. Following a different trajectory, Voyager 2 arrived four months later. 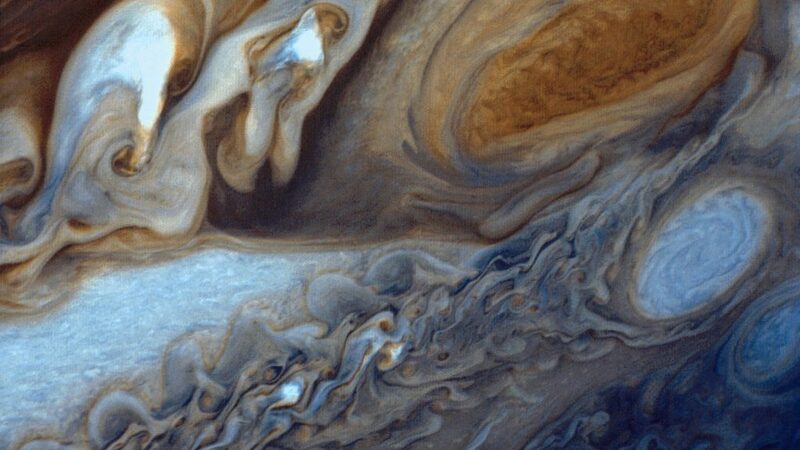 The two Voyagers shot more than thirty thousand photographs of Jupiter and its moons. The pictures were transmitted to the Jet Propulsion Laboratory in Pasadena, California, during the time I was Artist in Residence there. Those mind-boggling images of sights no human had ever laid eyes on had a huge impact on my art. A couple years later, both Voyagers flew by and photographed Saturn and its many rings and moons. Fast-forward to today: Voyager 1 is now the first man-made object to leave the solar system and enter interstellar space. Voyager 2’s close behind.